A multifunction device (MFD) is a device that performs a variety of functions otherwise carried out by separate devices. An example of this would be a printer that can make copies, faxes and scans. While these devices were originally designed for households and small businesses, many manufacturers, including Xerox and HP, now offer larger units for mid-sized to larger businesses. In addition to copies, faxes, and scans; some MFD’s offer features such as cloud storage, translating capabilities, document security, and mobile connectivity. So, why invest in an MFD? Devices with the same functionality are also called “MFPs”. To further add to the fun, “MFP” can stand for “multifunctional peripheral” or multifunction printers.” For convenience, if you see MFP, it’s usually safe to assume that is referring to “multifunctional peripheral” designed for home or desktop use. MFP (multifunction printer) usually equals a copier designed for office use. And, bear with me, “copiers” no longer just copy (they print, fax, and scan too) and many manufacturers, like Xerox, call them multifunction printers. Finally, you might also see “all-in-one” printers used. Depending on the context and the product, that could equate to MFP -- peripheral or printer. While single-function printers and scanners continue to have value depending on business needs, the most common office tool is the MFD. For convenience, we generally use “printer” to encompass all of the above. For your sanity, regardless of what it’s called -- it’s the hunk of plastic, glass, rollers, and software in your office that handles your paper document output and input needs. As we engage in the sales process by asking questions and understanding your business needs, we will get into the specifics of different devices (maybe you’ll need two black and white laser printers, a color copier, and a low-volume dedicated scanner -- we won’t know until we work with you to uncover your business needs). OK, now that you know the lingo, here are seven reasons to invest in a copier. Having a single device able to do everything makes your life easier. If you fax infrequently, buying a fax machine makes no sense. An MFD can include fax functionality and little to zero additional cost. The convenience of being able to copy, scan, and print from a single device is also a plus. Not to mention, you only have one cord to manage. No more having a separate machine for every task in your office. Before you may have needed one fax machine, one printer, one scanner, and a photocopier. Collectively these devices took up space -- and everyone could always use extra space. With four functions in a single device, you now have extra space which you could use to put in a nice, healthy plant or aquarium for a little office zen! Another advantage to the MFD, you have one price for multi-functionality. Although the price for the MFD may be higher than a traditional printer, the price still adds up to less than all of the necessary machines separately. In addition to the cut costs from having only one machine, you only have to keep up with the maintenance and supplies for one machine, including ink/toner, paper and repairs. Every device you plug into a socket draws power. While this might not seem like a lot of money, over time, removing multiple devices from your office will lower your energy bill. Over the years, those small savings add up. Additionally, newer equipment is more energy efficient, which leads to increased cost savings as well. Xerox technology allows for multi-tasking while our competition does not. 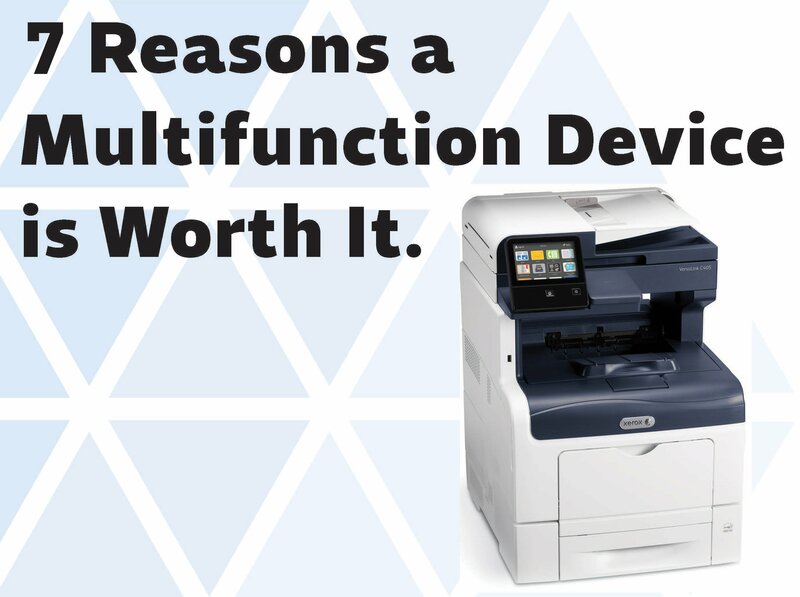 With an MFD, you can perform multiple tasks at once -- a print job can output while you’re scanning in a document or receive a fax and copy. After all, an MFD isn’t very multifunctional if it can only perform a single function at a time. You spend less time at the device so you have more time to get to the important matters in your home or office. Xerox printers have an ecosystem of productivity-boosting apps. From scan-to-email (and other destinations) to mobile printing, Xerox Connectkey-enabled devices help you do more with less stress. We’ve even written an eBook about it! Download your free copy here! With the extra features included, the productivity in your office will increase drastically. You will save time, money and space by purchasing a multifunction device for your home and office. Because too many offices purchase their printers, MFDs, etc. haphazardly, office managers have to juggle buying supplies for multiple devices from a handful of manufacturers -- a tedious pain. With an MFD, you buy supplies for one device. This also reduces waste, as many offices over-purchase supplies, which leads to closets with ink cartridges and toner for multiple devices (some you may no longer even have! ).